My son and I are getting ready for the new Star Wars Rebels series. This series is somewhere in the timeline between Episode III and IV. Anakin has become Darth Vader and the Republic has been destroyed. The Jedi have been completely decimated, and many think that they are extinct. Of course we know that Yoda and Obi Wan are alive, but they have retreated into hiding. What happens when some of the other Jedi who realized what was happening have gone into hiding as well? I can't wait to see this story and get ready for the upcoming Episode VII. This story is being told by John Jackson Miller. He has written several novels and was even key in the Star Wars: The Clone Wars series. I think that his take on this time period and his knowledge of Lucas' universe will be amazing. 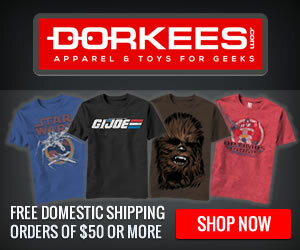 I am also attempting to bring you the best in apparel and other accessories related to Star Wars. We are now an affiliate with Dorkees and using this link and purchasing items will not only keep this site alive, but we will be donating 10% of all revenue to The Big Four Foundation to help families. Feel free to hit the link and purchase some cool gear for a great cause.